Bu çalışma ile proje tabanlı öğrenme yaklaşımının öğrencilerin merkezi eğilim ve yayılım ölçülerine yönelik istatistiksel okuryazarlık seviyelerine etkisinin ortaya çıkarılması amaçlanmıştır. Yarı deneysel çalışma yönteminin benimsendiği çalışmada, deney grubunda proje tabanlı öğrenme, kontrol grubunda ise geleneksel yaklaşım etkinlikleri yürütülmüştür. Geliştirilen veri toplama aracı gruplara uygulama öncesi ve uygulama sonrası uygulanmıştır. Elde edilen ham puanlar Rasch analizi yapan bir program ile lineer puanlara dönüştürülmüştür. Bu lineer puanlar ile ANCOVA analizi yapılmıştır. Uygulama öncesi ve sonrası istatistiksel okuryazarlık seviyeleri kişi madde haritaları ile ortaya konmuştur. Ayrıca deney grubunda yapılan mülakatlar nitel olarak değerlendirilmiştir. Elde edilen bulgulara göre proje tabanlı öğrenme yaklaşımının öğrencilerin merkezi eğilim ve yayılım ölçülerine yönelik istatistiksel okuryazarlık seviyelerini arttırdığı sonucuna varılmıştır. This study investigates the effect of project based learning approach on students’ statistical literacy levels towards central tendency and dispersion measures. Quasi-experimental research model was used. A test was developed and applied as pre and post-tests. The data were analysed using Rasch (1980) model. All raw scores transformed lineer scores by Winsteps 3.72 and ANCOVA analysis is used. Person item maps were produced and study supplemented with qualitative data. The results of the study revealed that the project based learning increased students’ statistical literacy levels towards central tendency and dispersion measures in the intervention group. Australian Education Council (1991). A national statement on mathematics for Australian schools. Melbourne: Author. Australian Education Council., (1994). Mathematics: A curriculum profile for Australian schools. Carlton, Victoria: Curriculum Corporation. Biggs, J., Collis, K. (1982). Evaluating the quality of learning: The SOLO taxonomy. New York, NY: Academic Press. Bond, T. G., Fox, C. M. (2007). Applying the Rasch model: Fundamental measurement in the human sciences (2nd ed.). Mahwah, NJ: Lawrence Erlbaum. Callingham, R. & Watson, J. M. (2005). Measuring statistical literacy. Journal of Applied Measurement, 6 (1), 29, 19–47. Capel, A.D. (1885). Catch guestions in aritmetic mensuretion and how to solve them. London: Joseph Hughes. Carnell, L.J. (2008). The effect of a student-designed data collection project on attitudes to- wards statistics. Journal of Statistics Education, 16(1). Cook, C.M.A. (1998). Designing a first experiment: A project for design of experiment cour- ses. The American Statistician, 52(4), 338–342. Gal, I. (2002). Adult statistical literacy: Meanings, components, responsibilities. International Statistical Review, 70(1), 1–25. Garfield, J. (1995). How students learn statistics. International Statistical Review, 63(1). 25–34. Garfield, J. ve Gal, I. (1999). Assessment and statistics education: Current challenges and directions. International Statistical Review, 67(1), 1–12. Garfield, J., Ben-Zvi, D. (2007). Developing Students’ Statistical Reasoning: Connecting Re- search and Teaching Practice. Emeryville, CA: Key College Publishing. Konold, C., Pollatsek, A. (2002). Data analysis as the search for signals in noisy processes Journal for Research in Mathematics Education. 33(4), 259-289. Koparan, T., Güven, B. (2013). Proje Tabanlı Öğrenme Yaklaşımının Öğrencilerinin Örnek- lem Kavramına Yönelik İstatistiksel Okuryazarlık Seviyelerine Etkisi. 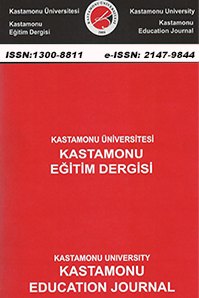 Eğitim Araştırma- ları Dergisi, 2(1), 185–196. Misailidou, C., Williams, J. (2003). Diagnostic assessment of children’s proportional reaso- ning. Journal of Mathematical Behaviour, 22, 335–368. Mokros, J., Russell, S. (1995). Children’s Concepts of Average and Representativeness, Jour- nal for Research in Mathematics Education, 26, 20-39. Moore, D. S. and McCabe, G. P. (1993).Introduction to the Practice of Statistics, Second Edition. Freeman, 794–795. National Council of Teachers of Mathematics (2000). Principles and standards for school mathematics. http://standards.nctm.org. Randall, G. (2006). An Exploration of Students’ Statistical Thinking. Teaching Statistics, 28(1), 17-21. Roberts, H. V. (1992), “Student-Conducted Projects in Introductory Statistics Courses,” in Statistics for the Twenty-First Century, eds. Florence Gordon and Sheldon Gordon, MAA Notes No. 26, Washington, DC: Mathematical Association of America, 109–121. Wallman, K.K. (1993). Enhancing statistical literacy: Enriching our society. Journal of the American Statistical Association, 88(421), 1–8. Watson, J. M. (1997). Assessing statistical literacy using the media. In I. Gal & J. B. Garfield (Eds. ), The assessment challenge in statistics education. 107–121. Amsterdam, The Net- herlands: IOS Press & The International Statistical Institute. Watson J.M. (2006). Statistical Literacy at School, Growth and Goal. Lawrence Erlbaum Assocıates, Publishers. Londan. 27–53. Yıldırım, H. H. (2006). The Differential Item Functioning (DIF) Analysis of Mathematics Items in the International assessment Programs. YayLmlanmamLK Doktora Tezi, Orta Do u Teknik Üniversitesi, Ankara. ISNAD KOPARAN, Timur , GÜVEN, Bülent . "Proje Tabanlı Öğrenmenin Öğrencilerin Merkezi Eğilim Ve Yayılım Ölçülerine Yönelik İstatistiksel Okuryazarlık Seviyelerine Etkisi". Kastamonu Eğitim Dergisi 23 / 2 (May 2015): 773-796.